All children are afraid of the night; when they grow up, they are still afraid, but more afraid of admitting it. In this frightening darkness men lie down to sleep and dream. Generations of diviners, black magicians, fortune tellers and poets have made night and dreams their province, interpreting the troubled images that float through men’s sleeping minds as omens of good & evil. Only of late have psychologists asserted that dreams tell nothing about men’s future, much about their hidden or forgotten past. In dreams, this past floats, usually uncensored and distorted, to the surface of their slumbering consciousness. This week, for the first time, a writer had attempted to make articulate this wordless world of sleep. The writer is James Joyce; the book, Finnegans Wake — final title of his long-heralded Work in Progress. In his 57 years this erudite and fanciful Irishman, from homes in exile all over Europe, has written two books that have influenced the work of his contemporaries more than any others of his time: A Portrait of the Artist as a Young Man, the best of innumerable novels picturing an artist’s struggle with his environment; Ulysses, considered baffling and obscure 15 years ago, now accepted as a modern masterpiece. there is not a sentence to guide the reader in interpreting it; there is not a single direct statement of what it is about, where its action takes place, what, in the simplest sense, it means. It is packed with jokes, plays on words; it contains nonsensical diagrams, ridiculous footnotes, obscure allusions. Sometimes it seems to be retelling, in a chattering, stammering, incoherent way, the legends of Tristan and Isolde, of Wellington and Napoleon, Cain and Abel. Sometimes it seems to be a description, written with torrential eloquence, of the flow of a river to the sea. As a gigantic laboratory experiment with language, Finnegans Wake is bound to exert an influence far beyond the circle of its immediate readers. Whether Joyce is eventually convicted of assaulting the King’s English with intent to kill or whether he has really added a cubit to her stature, she will never be quite the same again. Whack Huno take your partner, Well the floor your trotters shake, Isn’t it the truth I tell you, Lots of fun at Finnigan’s Wake. Whirl your liquor round like blazes, Arrah gudaguddug do you think l’m dead? On this old song Joyce has played a characteristic trick. Besides reminding readers that they are in for an Irish evening, his title might be taken as a simple declarative sentence meaning that Finnegans wake up. Hence the implication: ordinary people (such as his hero) do not; the nightmare existence of Everyman ends merely in a deeper sleep. Story. As readers hack their way through the thorny pages of Finnegans Wake, they become aware of certain figures and phrases that recur frequently — H. C. Earwicker, Anna Livia, Maggie, Guinness, Phoenix Park, the River Liffey that curves through Dublin. Tracing these characters and places as they bob in and out of apparently unrelated words and sentences, Critic Edmund Wilson has worked out the most intelligible interpretation of the book, supported by Joyce’s own statement that, as Ulysses is a Dublin day, Finnegans Wake is a Dublin night. The long confused passages in which people change shape, the speeches that sound matter-of-fact but turn out to be gibberish, the flights, pursuits, embarrassing situations which are oddly taken for granted—all these are not mere plays on words or literary jokes; they are dreams. Central figure appears to be a middle-aged Dubliner of Norwegian descent named H. C. Earwicker, once a postman, a shopkeeper, hotelkeeper, an employe of Guinness’ Brewery. He is married to a woman named Maggie, and father of several children, but involved in some way with a girl named Anna. Earwicker has been mixed up in some drunken misdemeanor, his dreams are filled with fears of being caught by the police. He dreams that he is coming out of a pub with his pals; a crowd gathers; one of the revelers sings a song, but it turns into a recital of Earwicker’s sins and folly. He dreams that he is called upon to explain the fable of “the Mookse and the Gripes”; as he begins, the Mookse comes swaggering up and attacks the Gripes, and suddenly Earwicker himself is going over one of his encounters with the police. Earwicker’s dreams, like most people’s, are troubled by hints of depravity, but they remain hints. Even suggestive words are disguised. Is the book dirty? Censors will probably never be able to tell. Melting and merging in Earwicker’s dream-state, like smoke in a fog, readers sense Anna, the girl with whom he is in love: Anna on the riverbank, Anna Livia, Anna Livia Plurabelle. Through the menacing or ridiculous distortions of his dreams, the thought of Anna Livia breaks with singular lyric beauty. There is no plot in the novel, no story in the usual sense of the word. What happens to Earwicker or what has happened to him—whether, indeed, he is as central a figure as he appears to be—is open to question: readers can construct a dozen theories to explain the form of the book, and find plausible evidence for each. Thus, it sometimes seems that sane speeches are not part of the dream, but voices from the waking world which dimly reach the sleeper. Sometimes it seems that he is hearing confused sounds of some turbulent life going on around him, which he dimly apprehends but in which he takes no part —as Finnigan might semiconsciously register the fighting and weeping over his bier. And there is a suggestion that as the dream ends, life itself ends, in the utter and profound sleep of death. But Joyce’s method is new. Dreams exist as sensation or impression, not as speech. Words are spoken in dreams, but they are usually not the words of waking life, may be capable of multiple meanings, or may even be understood in several different senses by the same dreamer at the same moment. Since dreams take place in a state of suspended consciousness, out of which language itself arises, Joyce creates, in Finnegans Wake, a dream language to communicate the dream itself. The Author. 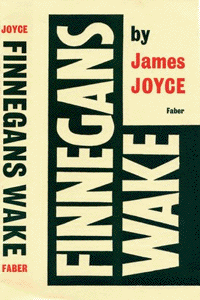 With the publication of Finnegans Wake, James Joyce has probably closed the cycle of his great works. Ulysses took seven years to write, Finnegans Wake, 17. At this rate of progression another book would take 41 years, making Joyce 98 when it was finished. Joyce left Ireland (“the old sow that eats her farrow”) 35 years ago and went to Trieste, then in Austria-Hungary, to live by “silence, exile and cunning.” In Trieste his children were born. In 1915 Joyce was so busy with Ulysses that he scarcely noticed that Italy and Austria were about to fight until frontiers began to close. A Greek friend (Joyce is superstitious about Greeks, believes that they bring him luck, that nuns do not) got him permission to leave through Italy. Along the frontier, each time he passed a station, it was dynamited behind him. Resettled at Zurich, Joyce taught at the Berlitz school, as he had at Trieste. Mrs. Joyce remembers poverty and small apartments, “long on mice, short on kitchen utensils.” But Joyce was happy, worked hard on Ulysses, enjoyed drinking white wine with English Painter Frank Budgen at the Cafe Pfauen. Lenin used to frequent the same cafe, but the literary and the proletarian revolutionists never met. Joyce’s admirers, George Moore, W. B. Yeats, Edmund Gosse, meanwhile began to worry about his perennial poverty, succeeded in getting him £100 from the Privy Purse, thought that Joyce should show his gratitude by aiding the Allied cause. Joyce, who was under oath to the Austrians not to bear arms and is resolutely unpolitical, thought he did enough by spreading British culture. He founded the English Players and put on his play Exiles. The annoying War over, Joyce returned to Trieste, but the Italians had got there first. There was constant turmoil while one of Joyce’s favorite authors, Commendatore Gabriele D’Annunzio, seized nearby Fiume. So in 1920 Joyce took his family to Paris, where he has lived almost continuously since. Europe in 1920 was still a shell-shocked continent in a state of suspended war. It was impossible to travel in most directions without traveling through armies, or in northern France and Belgium through heaped wreckage and broken walls. Revolutions threatened and populations starved. Joyce in Paris was close to starving too. But help came to him from U. S. and English expatriates. American Poet Robert McAlmon lent him money, Bookshop Owner Sylvia Beach began publishing Ulysses. Ezra Pound, Idaho’s great expatriate, introduced him to Harriet Weaver. Owner of the Egoist Press, publisher of The Egoist, Harriet Weaver was a shy little wisp of a woman, terrified by the dramatic manners of the literary great she patronized. She has been called “an authentic but difficult saint.” To Joyce she proved an angel. In 1922, to assure him complete peace of mind and concentration on his work, Egoist Weaver gave him a large sum of money outright. Most reliable information puts it at £40,000 (about $200,000). With this gift Joyce’s biography becomes largely a bibliography. Nono. In appearance Joyce is slight, frail but impressive. He stands five feet ten or eleven, but looks as if a strong wind might blow him down. His face is thin and fine, its profile especially delicate. He wears his greying, thinning hair brushed back without a part. Joyce reads and writes sprawling in bed or on a couch but he does not like it known. He is very formal in public, in restaurants prefers straight-back chairs in which he sits bolt upright. 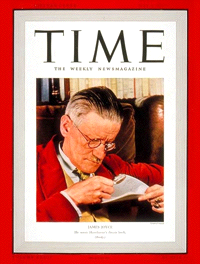 But no observer of his life and works can fail to note that James Joyce is a typical Irishman. Born in Dublin, he remains as Irish in Paris or Trieste as he was in the city of his birth. His friends believe that nothing short of a European war could drive him back to the “little brown bog” and the haunting Liffey.